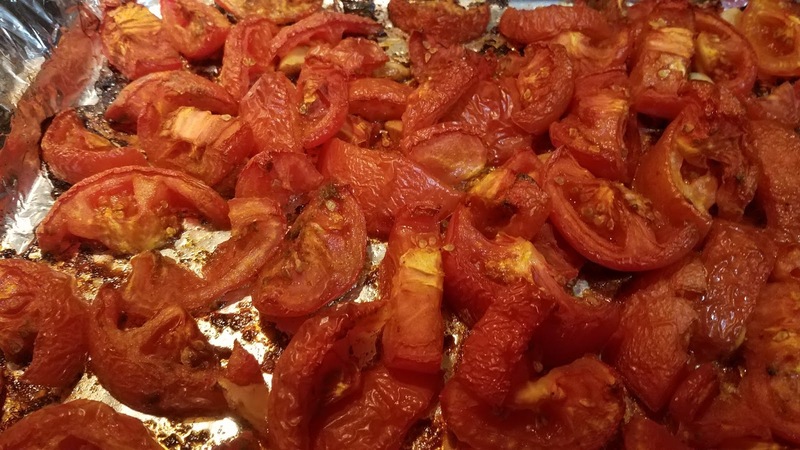 It may seem sacrilegious for someone in Northern California to use fresh tomatoes in winter, but roasting them with garlic and warm spices brings out their flavor and creates a comforting flavor and aroma. 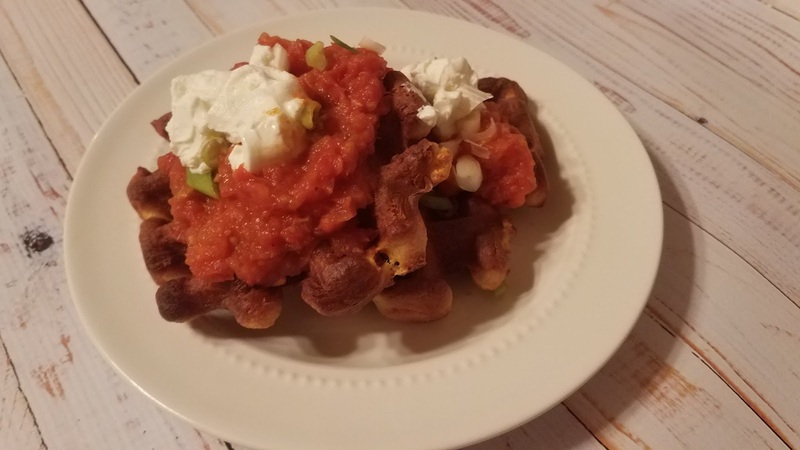 A few weeks ago, I was trying to think of a good non-cheese sauce for savory waffles (omit vanilla from basic recipe), and this popped into my mind. My plan for tomorrow will be to bake eggs in it for a pepper-free shakshuka-type dish. It also works with chickpeas, roast chicken...anything fairly neutral. 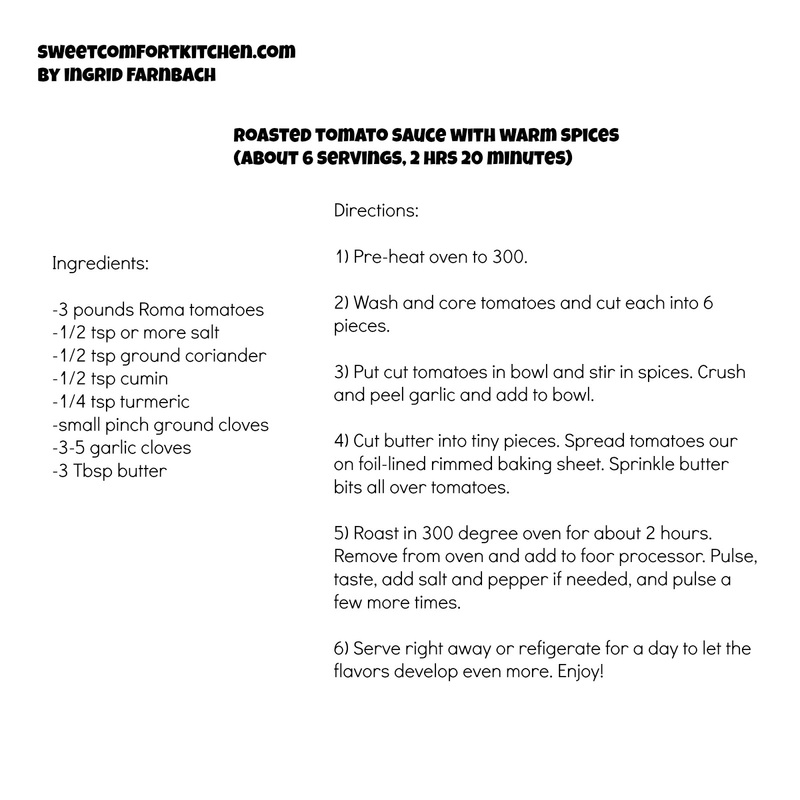 Makes about 6 servings, takes under 2.5 hours total. It does take a bit of time to roast the tomatoes: about two hours. But the rest of it is quick and easy. Set the oven to 300 to pre-heat. Wash and core three pounds of Roma tomatoes, being sure to get all those dang supermarket stickers off. Cut each one into six pieces using your paring knife if it's sharp enough, or a serrated knife if it's not. I adore this paring knife, and it's a cheapie! Amazon affiliate link to the Zyliss knife here. 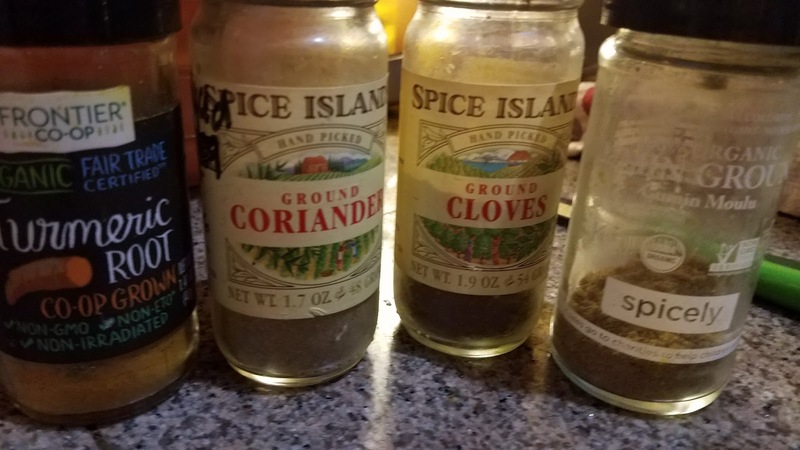 Put them in a large bowl and toss with 1/2 tsp salt, 1/2 tsp each coriander and cumin, a tiny pinch of ground cloves, and 1/4 tsp turmeric. 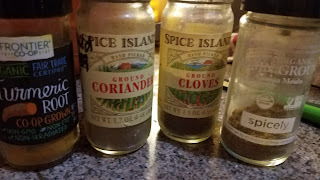 If you like, add 1 tsp honey (AH phase 2), but it's not necessary. 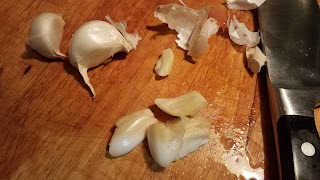 Peel and smash some garlic cloves...these are humongous so I'm just using three. If you have little ones, you might want five. Cut them in halves or thirds but no need to mince them. 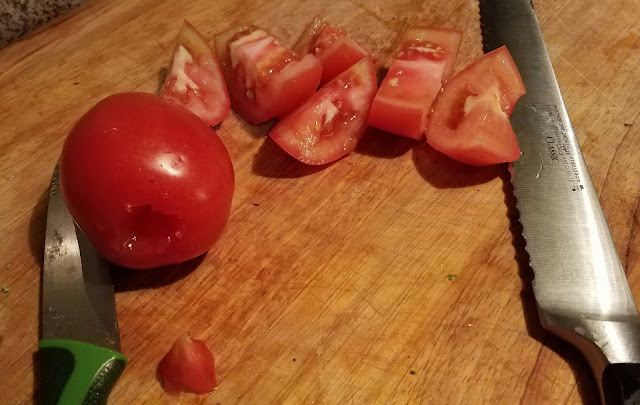 They'll soften up with the tomatoes. 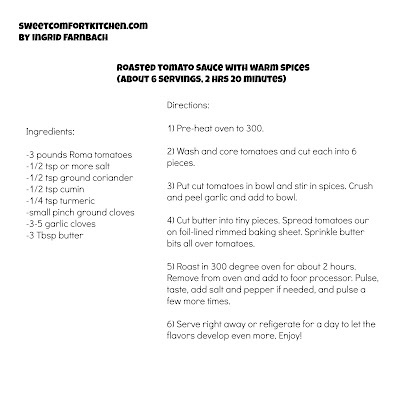 Stir them into the bowl of tomatoes. Cut up three tablespoons of butter into tiny pieces...if you're not into butter you can use olive oil. 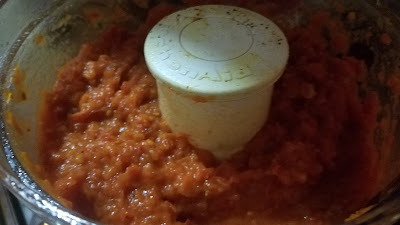 I'm into butter with tomatoes now that I know that Marcella Hazan's famous tomato sauce uses it. I mean, I'm a big fan of the pink sauces with tomato and cream, so it makes sense. 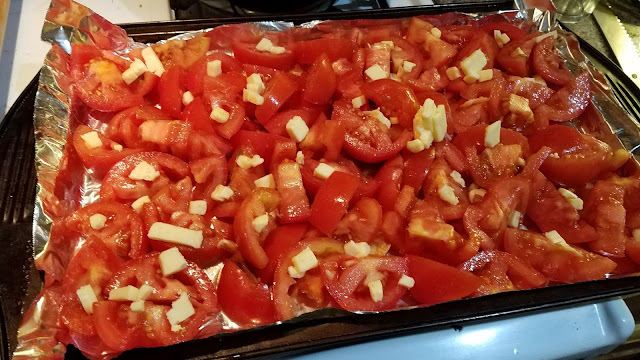 Line a rimmed baking sheet with foil for easy cleanup (this one is 10" x 15") and spread out the tomatoes across it. Sprinkle the little pieces of butter across the tomatoes.